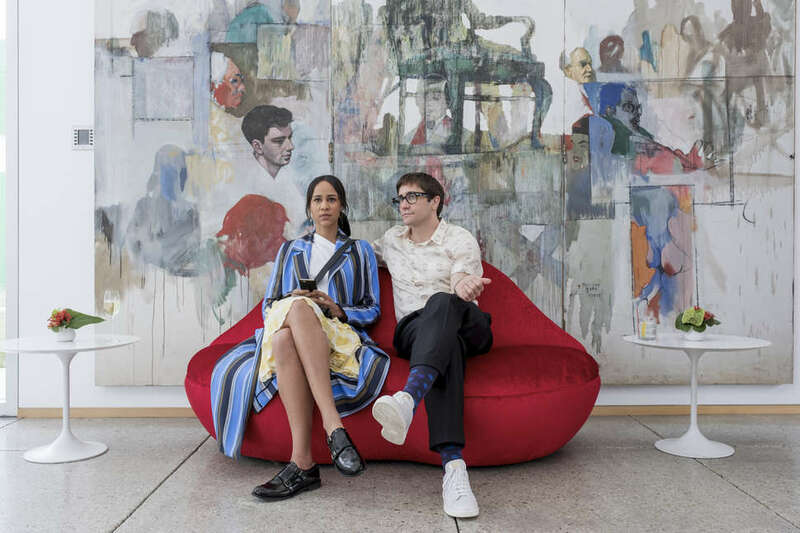 This interview contains spoilers for Velvet Buzzsaw. 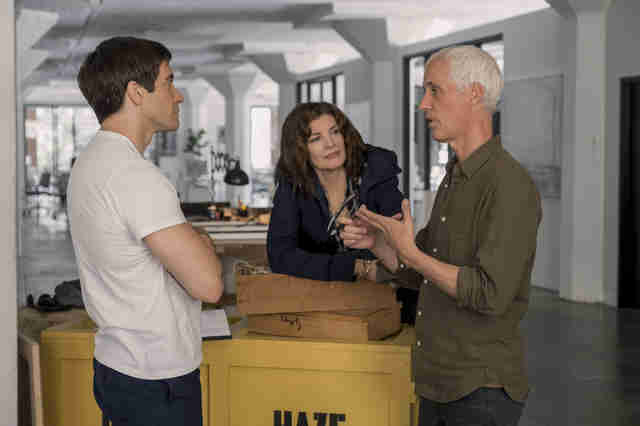 Talking to writer-director Dan Gilroy about his new Netflix movie,Velvet Buzzsaw, is like experiencing a tidal wave of cultural references. Among the ones he drops: Robert Altman, the Final Destination franchise, Ralph Waldo Emerson, and Gilroy's own failed project Superman Lives. 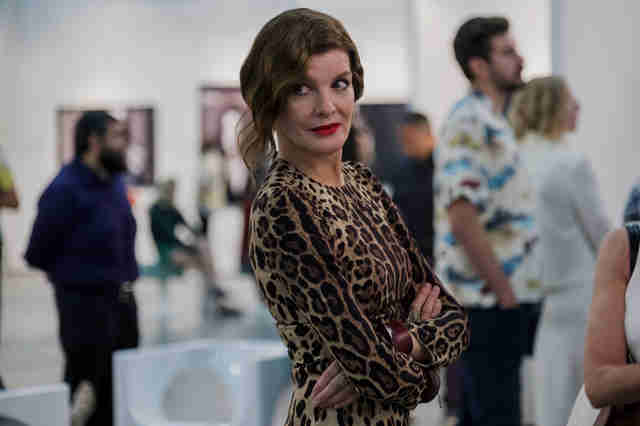 It's this hodgepodge of interests that inspired a wild ride of a movie where pieces of contemporary art pick off a bunch of gallerists and aesthetes in increasingly violent ways. The film, which dropped on Netflix last week after premiering at Sundance, follows the terrors inflicted on the likes of critic Morf Vandewalt (Jake Gyllenhaal) and dealer Rhodora Haze (Rene Russo) -- who both worked with Gilroy on his 2014 movie, Nightcrawler -- when they start to posthumously promote the disturbing work of "outsider artist" Ventril Dease after one of their ilk (Zawe Ashton) finds him dead in her apartment building. It's high art mixed with high camp and it's stupidly fun. When we got on the phone with Gilroy, we picked his brain about those ridiculous names, the film's bloody deaths, and that tranquil final shot. Thrillist: The names in this movie are crazy: Morf, Rhodora, etc. How did you come up with those? Why did you? Dan Gilroy: That began the first time I read a Dickens novel, and my love of Dickens has only increased over time. Dickens was a master at using large casts and defining them in incredible ways, and one of the ways he did them was with names. It was slightly elevated, almost hyper-real names. I've always been interested in using names to flesh out a character. In this campy, kitschy satire of a world we were creating, I wanted names that were a little over the top. I do collect names. I have files of names. Morf Vandewalt is a name I came along a number of years ago in research. I did research on a film set in the South in the 1860s and I was looking at Census Bureau names, I was pulling names out, and one of the names I pulled out was actually Ventril Dease. So Ventril Dease was actually a person who lived back in the 1850s in the South. Can you talk a little bit about building this world and where you wanted it to be heightened and where you wanted it to be resembling the actual art world? Gilroy: The building of the world and the scope of the world really comes from a very early decision to make a Robert Altman-like film. Robert Altman was just a master at fusing ensemble casts to give a wide-angle look at a world and a group of people. Once I knew I was going to put a wide lens on it and have a wide group of people in it, then the look of the film started to find itself, which was we're going to go everywhere. We're going to go to galleries, we're going to go to studio spaces, we're going to go to an archivist's office, we are going to installers. Right away, the look of this film just expanded. There was no place that we were not going to try to look. Very early on, I asked myself the question that if this film was a movement of art, what would I want it to be? And I decided that I wanted it to be pop art. I wanted it to be gaudy and bright and flashy. And I wanted to use contemporary icons to challenge tradition and really send them up in a collision. So the tone of the movie and the gaudiness and the vividness of the colors and all that really comes from this consistent goal that we all had to making what we consider to be a piece of pop art. You're satirizing the contemporary art world, which is different from the pop movement. 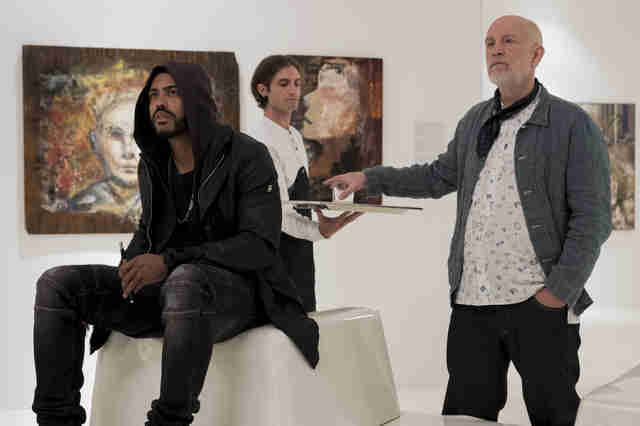 In the movie, there's a definite disdain toward the way the contemporary art world and its market functions. What bugs you about that and how did you want to approach those sore points? Gilroy: Pop art transferred to film becomes a little bit satirical, it becomes a little campy, a little kitschy. It becomes a little humorous, and humor is a very powerful way of transmitting what I believe to be serious ideas. So the ideas that I'm transmitting in this film that are relevant to me really begins with the idea that contemporary art began as this movement that was supposed to provoke and challenge and has just been co-opted by money. It's out of balance. I was interested in that. I was interested in exploring the idea that the contemporary art world, because of the big dollar signs and because everybody's chasing it now, is having a twofold effect. It's crowding out new voices. There's just not enough wall space for new voices. That's a really sad thing. I think any media that starts crowding out new voices is deteriorating from the inside out. The other is that artists themselves who want to be shown could drift into the realm of being branded. I'm not saying that branding is the worst thing in the world. But once you become a brand, you do sort of run the risk of losing something challenging. So artists, because of the big money, are less inclined to experiment. I'm interested in the idea of what money can do to the people who are on the commerce side of art, and certainly what it can do to the artists themselves. So those were the weighty ideas that were underlying the pop art tone of the film. Who were your modeling Ventril Dease's art after? Gilroy: We didn't model it off of anything. Once we decided he was an outsider artist, we thought we could do whatever we wanted. The characters define the art. We knew the artist was never going to want his art sold. So why [make art]? And then we decided the reason was he used the art as a cathartic experience to work through horrific childhood trauma. The paintings started to reveal themselves. He's painting childhood trauma. So we knew they were going to be representational. You've got to see a father and a mother and a sister. Then we decided on a color palette and we started to go for a darker earth tone color palette. It was a lot of trial and error over six months and that became the canon of Dease's work. The movie doesn't explicitly say how or why Dease's paintings are provoking art to kill people. I was wondering if you had a further explanation or if you wanted to stay away from over-explaining the supernatural. Gilroy: The explanation that I used in describing it to our department heads was that when you're looking at any piece of art, you are looking at something that the artist has invested their soul in. We started looking at the paintings as almost a thin barrier to another dimension. Right beyond the paintings, there's an entire other world where artists' spirits live. Then we decided any piece of art can be a conduit for this malevolent spirit. We tried very much to make that clear to the audience. When other objects of art are being inhabited, I'll tell you the trick: Any time somebody's about to be killed by a piece of art, we'd always underline the fact that there was a Dease painting in a room, there was a Dease reference. Dease is here and he's coming through the art. It was a really simple strategy that we were going for. You keep Dease's connection to the art world tenuous. He's creating art out of this place of pain. Did you ever think about taking it a step further, explaining the way Dease might have felt about the way the commercial art world functions? Or did you see him as a separate entity? Gilroy: He was a separate entity. And the reason we did that was -- again, this goes to the satirical tone we're doing. Dease is really representative of a malevolent spirit. I always think it's the campiest moment in the movie when Zawe Ashton's character [Josephina] walks into a dark room and there's gothic music playing and she goes, "Here, kitty kitty." It's like from a cheap B movie from the '50s. That was this gothic, campy spirit that's roaming around this piece, so we never really felt the desire or need to get too specific with it. He's there to serve a purpose, which is killing people in hopefully fun ways, and that was really the reason we felt we didn't need to go any deeper with it. I wanted to ask you about Velvet Buzzsaw, not just the title, but this sort of punk art collective that we learn Rhodora was a part of in the past. Where did that come from, and how did you want that to function in the film? Gilroy: When we knew we were going to do a Robert Altman-type large cast, some of the characters that came up were gallery owners. I knew I wanted to write a part for Rene, so I knew I was going to have a female gallery owner. I became intrigued with the idea of someone who had an artist past who is now purveying art. But rather than make her an artist in a painterly sense, I thought she was a musician. She's really tough in a very tough world, so I thought punk rock. When I went back and looked at all girl punk groups from the '70s, there were edgy, sexually connotative names attached to some of these groups. 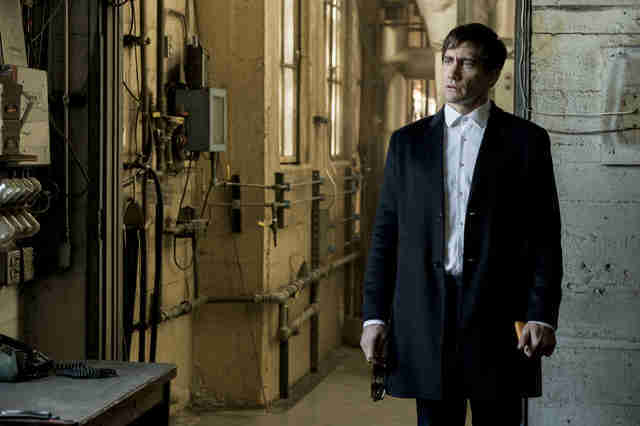 I thought, well, Velvet Buzzsaw is sort of an odd sort of thing that might have been credible back then. Once I came up with that after finishing the script, those two words [came] together. Something that's soft and luxurious, but at the same time, can kill you. It just felt like tonally it fit with the film. Because you're riffing on pop art, was "Velvet" any connection to the Velvet Underground? Gilroy: Not consciously, but I was aware of that and I did like that connection. So it was really just the way the words sounded together? Gilroy: And also in the context that I see the movie as pop art, that was always sort of the media that we saw ourselves as. I could imagine a piece of pop art being called "Velvet Buzzsaw." It's a gaudy name, it's a big, brash name. I thought it fit in with the tone of this film, which is rather brash. Did you come to Rhodora's past and the title before or after you came to her being the death by tattoo? Gilroy: I came up with it before. But once I realized that's who was going to kill her, that helped cement the idea that it had enough relevance in the film that it could be the title. It actually fits into the plot. Had we not had her death be tied into that, I don't know if I would have called it that. I might have thought those two words would have been too tenuous. But because it was so integral to the plot, it felt right. It's a little bit of twist: You think all the art has been removed from the house, but it's the art on her body that gets her. It's connected to this more pure artistic past she had. What was the thinking behind that? Gilroy: On a purely practical level, I'm an enormous fan of the Final Destination series. What I loved about the first one is every death scene topped the death before it. You're like, Oh my God, what they can do next? We didn't figure that death out almost until close to shooting. What are we going to do to top all of these other deaths? And it was just the idea that she suddenly recreated this painting that you'd seen and then she was killed by the thing that you forgot was there that she could never escape. It's sort of like The Ring, you watch the video and you can never escape no matter what happens after that. It was really just an attempt to top all the other deaths and come and surprise you. Jake Gyllenhaal's performance as Morf is hilarious. How much of the creation of Morf and your ideas of him were on the page versus what Jake came to set with? Gilroy: I do very little [character] description in my script. The words are there, the scenes are there, the structure is there. The character was speaking. The character was moving through the world as he moves through the film, but there was no description of what he looked like. So Jake comes in and creates the entire look and feel and vibe of the character. Certainly changes lines once in a while. Jake takes these two-dimensional things that I have on paper and breathes life into them. I think Rene does that, too, and the other actors do that. I leave a lot of blank space for all the actors to come in and create and own the character themselves. What most surprised you about his Morf? Gilroy: How Jake allowed himself at times to really go campy with it, which I loved, which was really the spirit of the film. The point where he comes upon Daveed Diggs and he shrieks: "The admiration I had for your work is completely evaporated!" I think that is a high point for the character. It was just great the way Jake utterly emotionally owned the sadness that he was feeling in that moment and how it came out through a criticism of the guy's art. Jake just really utterly embedded himself in the character. Toni Collette's death is so gruesome. How did you come up with "Sphere," the piece of art that kills her? Gilroy: I came up with "Sphere" because I remember as a kid watching Roman Holiday and there's a scene where Gregory Peck sticks his arm in a hole and Audrey Hepburn shrieks. That always stayed with me. I don't know why it did. But when it came time to write the script, that was the first piece of art that I thought to describe. Something you put your arm in and it scares you and what shape is it. And [production designer] Jim Bissell and other people came in and starting helping the design with it. What was it like doing all that blood spurting? Gilroy: There was a time when we first started filming where I really thought we were going to have a minimal amount of blood. Then when we shot it and Toni was sort of pirouetting out of view and we thought, let's green screen her arms so we can do something with that down the line. We started to back up, we added some blood and then we added more blood. And then one day, we decided, what does it look like if the blood spurts out all over the place? Then, suddenly, it's like, let's have the blood hurtling out of the holes of the thing like a fire barge shooting fountains of water. We all just started laughing and it just became this giggly, over-the-top moment of bloodletting. You end the film on John Malkovich's artist character Piers and the lines in the sand that he's drawing. What was the significance of that for you? Gilroy: John Malkovich's character is a guy who's creatively stuck. He's branded himself. Alcohol doesn't work anymore, and Rhodora's come to him and says: "The only way out of this is to forget about the dependency to things you've done before." She tells him to go to the beach house. He's a guy whose paintings normally sell for tens of millions of dollars, and now, here he is doing it on the sand and the waves are washing it away. And that comes from a personal experience I had when a major film fell apart, Superman Lives. I went down to the beach. I felt like I could have written these words in the sand and had the waves wash them away for everything that it was worth. And I had to make peace with the idea that it had its own value that I've worked on this beyond that. The idea of that ties into Rhodora's name. Rhodora is a flower, and I'm aware of it because Emerson wrote a poem called "The Rhodora." In the poem, Emerson is walking through the woods and comes upon this beautiful flower, this Rhodora, and it's so beautiful, and nobody else sees it, so he starts wondering what is it's value. I've always remembered these lines from it. It's towards the end and he says: "Rhodora! If the sages ask [thee] why / This charm is wasted on the earth and sky, / Tell them, dear, that if eyes were made for seeing, / Then Beauty is its own excuse for being." And at the end of the film, Piers is making beautiful images on the sand that are being washed away, and ultimately, from an art standpoint, it's not about a worldly success, it's not about the money or the clicks or the auction price, it's the creation of the thing. That has, to me, the most intrinsic value.